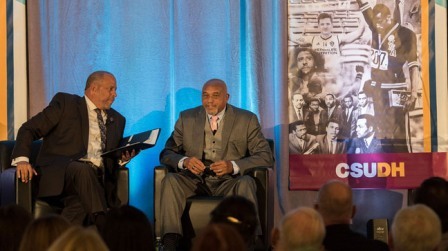 Following Smith’s remarks, he sat down with President Parham for a short Q&A, which led into a panel discussion focused on how Smith’s courageous act has inspired generations of athletes to speak out on social and political issues. The panel was moderated by Steve Wyche, a reporter for the NFL Network’s show “Total Access,” and first to report on former NFL player Colin Kaepernick’s now-famous protest during the national anthem. The panelists included retired NFL star Reggie Bush, who spoke out about the officer-involved deaths of Erik Garner and Michael Brown that made national headlines and sparked the Black Lives Matter movement. 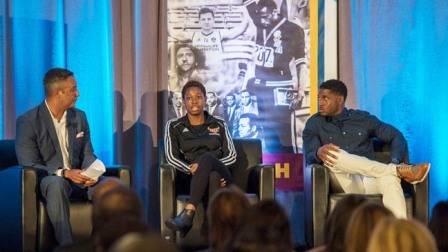 Steve Wyche, a reporter for the NFL Network’s show “Total Access,” Steve Wyche, a reporter for the NFL Network’s show “Total Access,” Esther Duru, a sociology major and middle blocker for CSUDH’s women’s volleyball team, and NFL star Reggie Bush.